Why aren’t employees getting more engaged with their employers? It seems that despite all the efforts, energy, and money spent on trying to improve how engaged people are at work, the needle is not moving very far. According to Gallup, the US employee engagement average was at 31.3% in 2011 and is still only at 32.7%, five years later. 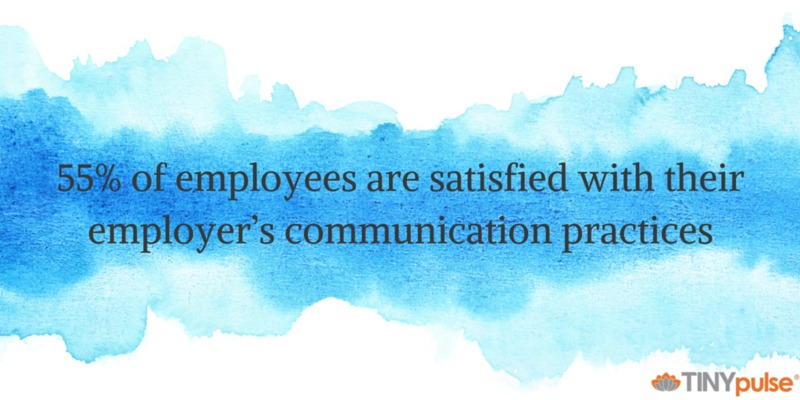 According to the APA Work and Well-Being Survey, only 55% of employees are satisfied with their employer’s communication practices. The big mistake that leaders make is they think employees can only handle good news and shouldn’t be exposed to the business challenges that an organization goes through. First, set a regular time to review business results and talk about strategies. Even if some of your team is remote, schedule consistent times for all employees to participate in town hall meetings. Go through the business results — the great, the good, the bad, and the ugly. Explain what impacted the results, and ask for questions. If there is really bad news, such as the company missing sales or profit goals for the year, you may need to schedule follow-up meetings so that everyone on the team understands the impact. Second, encourage two-way communication. Ask for questions and suggestions. Ask employees for their wish list of things they would like to see the company do. If you don’t have the answers, get back to people later. Giving them a voice in the company (that you take seriously) will build trust that you care about their opinion. Walk the talk — always. Values are tools that help employees know what is important to the organization and helps guide them on decisions they have to make. However, nothing will damage the trust relationship more than seeing an employer make decisions that are counter to their values. You erode your credibility, and therefore, you erode trust. 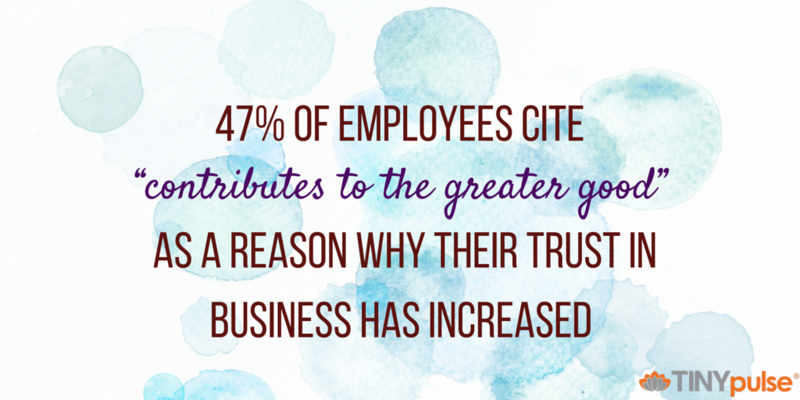 According to the Edelman 2015 Trust Barometer, 47% of employees cite “contributes to the greater good” as a reason why their trust in business has increased. Examples of this would be supporting a nonprofit with money or time, donations at the time of a natural disaster in the area, or providing relief for a sick or injured employee or family member. Employees want to see that it’s not all about profit and that the company can be trusted to make decisions that show compassion and empathy beyond the bottom line. Recognition alone helps improve employee engagement, but it can also help build trust. Employees want to know that what they contribute to an organization matters and that leadership recognizes their efforts. Employers that fail to genuinely recognize employee contributions, even at the lowest level of an organization, risk looking self-absorbed and out of touch. A heartfelt thank-you for a job well done will not only make your employees feel valued, but also build trust that you are paying attention to them. Many leaders think that most employees are not knowledgeable enough or smart enough to help solve challenges and issues that a company might face. In fact, the opposite is true. Employees that are closer to the customer or end user often have a better understanding of the issues because they live them every day. If employees see the leadership of the company consistently make decisions without input from them, it’ll erode the trust they have that management really cares about a solution that will actually improve the issue. 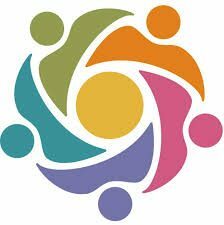 Involve end users in meetings about issues the company is facing is one way to build trust. Testing solutions with key stakeholders and then really listening to their feedback will also improve trust. 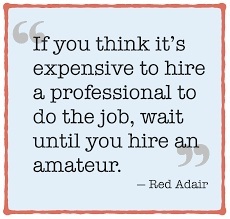 Trust doesn’t come easy and must be constantly re-earned by the employer. But if you make the effort, you will build a reservoir of good will that you can draw on during challenging and difficult times. Previous IS TOO MUCH FOCUS ON EMPLOYEE ENGAGEMENT BECOMING A BURDEN?